RepRap 3D printers with multiple extruders are becoming increasingly common however the majority tend to have dual extruders rather than 3 or more. Released in December 2013, the Duet 0.6 is now an established 32bit 3d printing electronics solution that has proven to be popular and versatile. With this in mind we decided to extend the Duet 0.6 to support two extruders on one board and developed the Duet 0.8.5. 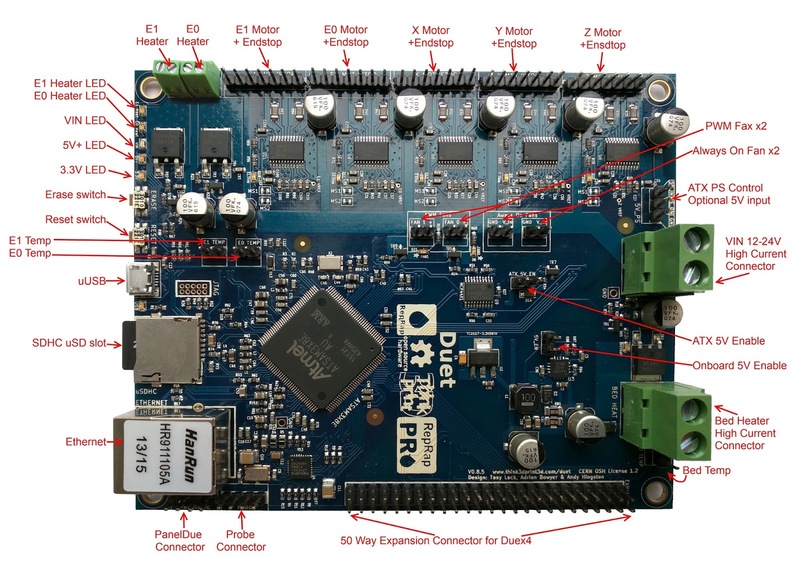 The new features are highlighted below and importantly it features the same expansion header as the Duet 0.6 so it supports a Duex4 expansion board. A Duet 0.8.5 + a Duex4 gives support for 6 extruders. That's 9 stepper channels and 7 heater channels including the heated bed! We should thank David Crocker (DC42 on the RepRap forums) upfront for his helpful advice in the development of the Duet 0.8.5. A second extruder channel (E1). A second PWM fan output. E1 motor current controlled by the SAM3X8E DAC0 channel. Thanks to David Crocker for this idea. Two "always on" fan pins. Dedicated header for the PanelDue. Dedicated probe header, supports many different probes including David Crocker's mini IR probe. 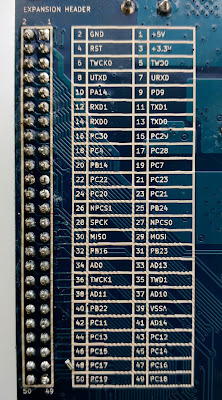 Additional pins accessed on the SAM3X8E processor to enable the new features. Lower noise components and circuit layout used for the 5V BUCK circuit. Complete ground plane - reduce noise and potential ground loops. Switches and power indication LEDS moved to the same edge as the SD/USB/Ethernet for simpler access and indication. VSSA now present on the expansion header. This combined with the changes to the Duex4 0.2a mean that analogue ground is now used for all 7 temperature measurement channels. USB is now a simple USB 2.0 device, rather than a Host/Device as before. This was never used on the 0.6 and removing it reduces component count. Removed the IDC headers for the heatbed and motor/hotend wiring loom. The footprints took up valuable board space and I am not aware of a printer that used a complex loom terminated in a single IDC. Extruder thermistor headers and fan headers moved towards the middle of the board to allow for the same board size as the Duet 0.6 to be used. In order to support a 7th heater channel (Extruder 6) along with two PWM fans the PWM pin had to be shared. This means that you can't run 6 extruders AND 2 PWM fans at the same time. In the same manner as the Duet 0.6 the Duet is based on the Arduino Due, and the KiCAD source files are released under the CERN OHL 1.2 license, which means you are free to modify them and distribute products based on them, as long as you share your modifications under the same license. We believe this is a much more appropriate license for Open Hardware than a Creative Commons/GPL or other licence based around copyright. The Duet 0.8.5 source files are available on GitHub so feel free to fork the project and modify away! 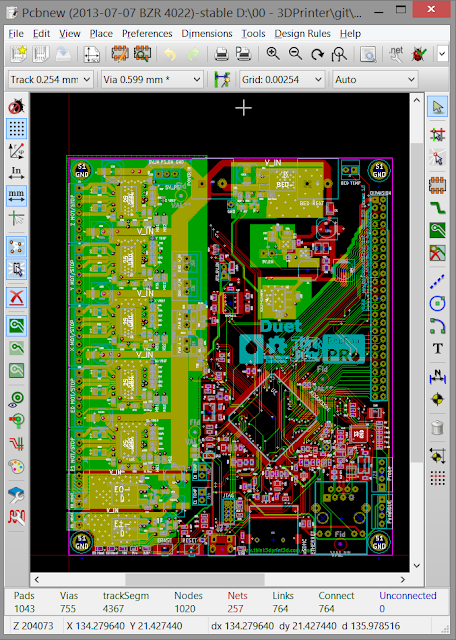 KiCAD has continued to improve since I started to develop hardware over 2 years ago. It is a powerful, Open Source design suite which means that the source files for the Duet are open for anyone to use and so is the software needed to modify them. The Duet 0.8.5 runs RepRapFirmware, the linked github page has the Think3dPrint3d latest version based on David Crocker's fork. I have made the changes required to support the additional pins, extruder multiple PWM fans and hopefully this will be merged into David's fork shortly. The firmware has also improved substantially since the Duet 0.6. The majority of these improvements Think3dprint3d can take no credit for as they are the work of the RepRap community. David Crocker has done excellent work in optimising the firmware and implementing segmentation free support for Delta printers. Old-style firmwares rely on segmentation to calculate movement but this can add printing artefacts. On David's fork the delta transform is calculated for each step, i.e. it's segmentation free, and thus the quality is higher. This is only possible due to the higher processing speed of 32 bit electronics. Also available as a bundle with the Duex4, and I will be very excited to see someone using all 6 extruders! Labels: 3D Printer electronics, Arduino Due, CERN OHL 1.2, Dual Extrusion, Duet, Duet 0.8.5, Duex4, Open Hardware. Is there a BOM available? Hi! Where can I find manuals? How to connect everything, install firmware (is it nesessary?) etc. The config.g file on the SD card can be edited for all the specific settings for your printer. I have Duet in my hands now. I connected USB and nothing happens, just 3 LEDs on: 5V, 3.3V, USB. I can't connect from the PC, I can't see it on my home network either. Best to start with the most similar printer to yours (Ormerod, Kossel, CoreXY) and rename that folder to /sys then edit config.g to match your printer. OK if the SD image is there I should be able to test it somehow. Does it work from USB power, without 12V connected? Can I connect to it via USB from Repetier or Simplify3D? Which baud rate should I choose? OK I edited the config.g and I can access the Duet on the network. Nice! I wonder why on the Duet the stepper drivers are not designed to be on plugable driver boards as on the Duex. In case of an burned/broken chip the complete Duet must be replaced. Is a plugable solution in scope ? Both the Duet and Duex4 use stepper drivers mounted directly on the PCB, this significantly improves the heat dissipation, allowing for higher stepper motor currents before needing heatsinks/active cooling because the larger board area acts as a bigger heatsink. We have found this combined with the thermal shutdown protection built into the Allegro A4982 drivers means that we don't get burnt out stepper driver chips. Turn off the power supply before pluggin in and unpluggin motors and that removes the other failure modes so on balance this was a better option. If you wanted to use high power stepper driver circuits then the expansion header allows you to drive a further 4 stepper channels and it is relatively straight forward to use external stepper boards connected to those, although you would need custom wiring. Hi Tony. May I know if the board can drive stronger stepper motor? You mentioned something about high power stepper driver circuits so I am not sure if it is the same with driving a strong motor. I have one more question that sounds silly, I am new to building 3d printers. Is it possible to drive dc motor with encoders with the pins? thanks for the details here. I really thought I have seen pin-and-socket connectors on the Duex4 but I can not find them on the pictures. I just installed Duet 0.8.5 to my delta... I find it pretty good, particularly web-interface. Thanks for the feedback. The decision on the order of the endstop pins is lost to me now so I can't comment on that. Editing the config.g file in the web interface would be good, for now the easiest is to edit a local copy and then upload it - almost as quick. The vast majority of the user documentation is the RepRap wiki's Gcode page, along with the Duet page but you are right more in depth documentation for the RepRapFirmware would be good. 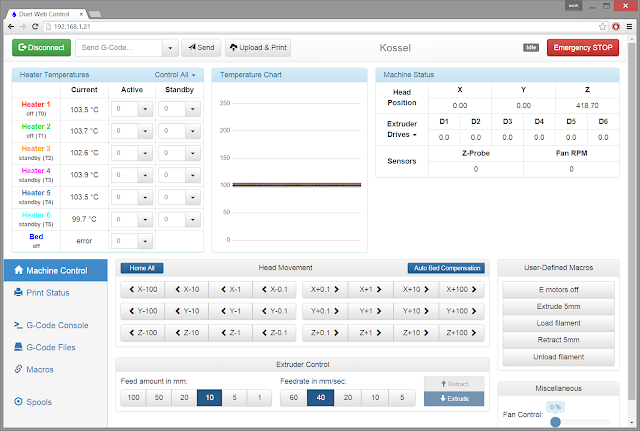 You can use the Fan0 PWM channel no matter what configuration. If you want to use the Fan1 PWM channel for a second independently controlled PWM fan then you can't use the 7th heater channel as that uses the same PWM channel. If you want to use pins that are allocated to a specific function in firmware (such as the PanelDue pins are allocated to serial communications) for another completely different function, then you will need to modify the firmware. I would pick pins that are on the expansion header of the Duex4 and not used for the PanelDue or probe if possible, that way your additional can be pulled into the main firmware in the future. Does the Duet support thermocouples or only thermistors to measure the head temperatures ? I looked at the schematics of the Duet 0.8.5 and please correct me if I'm wrong. It looks like there is only one end-stop switch per axis. Does this mean the Duet can use the end-stop switches only as reference for start point (lets say min postion of axis) and do the other side (max postion of axis) only via software calculation ? Would it be possible to use further digital output pins for switching stuff light buildroom light , buildroom heating, buildroom ventilation, adding a webcam feature for abserving the buildroom and possbibly more extruders than the 6 with the combo of Duex4 ? There was some comment of a Duex8 on the Duet 0.6 thread. You can not stream video though the Duet board, but there is nothing stopping you setting up a wireless/networked webcam on the same network as the Duet to observe a print. With 6 extruders, a heated bed and a PWM fan you are at the limit of the PWM channels on the SAM3X8E processor. you could add another extruder by not using PWM on the heated bed (Bang Bang is fine for heated beds generally) and then configuring a few additional unallocated pins to do step, dir and enable. I would love to see a 7+ extuder printer!! M42 link has the pin numbering for 0.6, right? What is the correct pins for 0.8.5? The pin number should be the same. We use webinterface. When we want to calibrate extruder by "Extrude" button on interface, it said no tool selected. We send T0 command and M302 P0 commands. 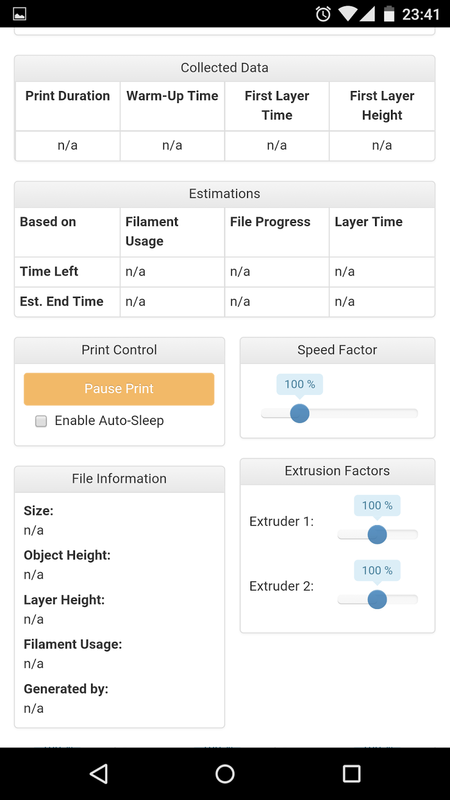 Now, it says "Extruding 1 mm of filament" but nothing happens. 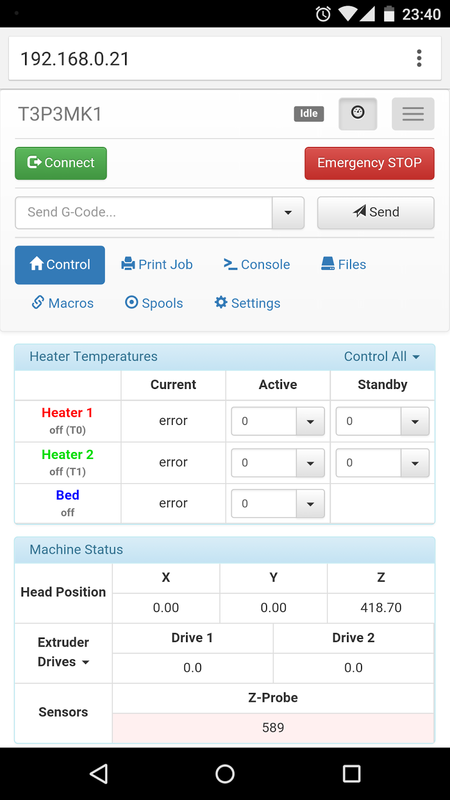 Moreover, when we set the hotend temperature to 240, nothing happens. "E0 Heat" led does not light. We think something is wrong in our configurations, but we could not find anything. Please help us for these problems. Hi Please email your config.g file so we can check the configuration is correct! It is supported currently coreXY? I bought one Duet 0.8.5 with Duex4 kit and it seems to be working. But I have started to print some parts and it looks like Duet get stuck at some point of time. First few times the the board stuck early, about 2-5 layer. Printing stopped, no network connectivity, and the PanelDue shows "starting up" and the board lost homming infos, I found no way to access the Duet again. Even a reset via the resetswitch shows no result . Only making the board completely powerless solves the situation. I felt the heatsinks on the driver ICs and they were more than warm but could be touched. M906 X1500 Y1500 Z1500 E1500. That allows printing (and finishing) 3 cm height snowman. Can you advice what I can check to solve the issue ? I have the heatsinks that was provided, installed and a fan is blowing from some distance to the heatsinks. Last time the error occured, the heatsinks has been nearly cold. Generally when the stepper drivers get too hot (high current and insufficient cooling) the thermal cut off built into the chips kick in and there is a brief pause in that channels motor movement until the chip cools down a bit. That sort of situation is not good but i have not seen it crash the main microprocessor on the board before. Generally issues with microprocessor crashing has been due to power supply issues, are you powering the duet using the onboard regulator or USB? issues with USB ground loops have caused some problems in the past so I recommend using the Ethernet and onboard regulator rather than USB after finishing the initial setup. It would useful to know how repeatable the problem is help get to the bottom if it. I 'm not sure about the first issue, where I had an PC ATX power supply attached to the Duet with using the ATX 5 v source. I still believe it was somehow related to the high values for the stepper current. Afterwards I attached an different external power supply to the Duet and use the internal 5 V source. With this power supply the error was pretty good reproduceable, but not exactly at the same point of time. I found out that the external power supply got hot and assume the power was not constant than. I switched back to the ATX power supply (300 W) and use the ATX 5 V again. But at lower current values in the config file . I did some bigger printings over 3 hours without issues, yet. I think the issue is the power supply, as you also pointed out. One question, you mention an Ethernet regulator, does this means the Duet can be powered over Ethernet for e.g. starting via network ? So I don't have to install KiCAD, can you tell me the mounting hole spacing? Are they the same as the 0.6 version board? Is it necessary the PC or mobile should be in interacting state with the printer until printing is done? or simply we can turn off the PC and turn on whenever we require at the time printing ? will this effect the printing process? Hi, no its not required as long as you are using the web interface. you can disconnect or shut down your computer once you have started a print and then reconnect it later. Does the 0.85 board have a 1k or 4.7k resistor for the temperature measurement? David Crocker's firmware doesn't seem to have support for Mendel included in it. Can I just toss a mendel sys file in from another source? As well as the delta ones (to pick up any latest changes), although not using the delay parts. The reset and Erase buttons. Do they soposed to be toggle buttons or do they get stuck when pressed? I have just received the duet and when i press it it seems to get stuck in and have to pull it out before i can press it again. They definitely should not get stuck in, that the first I have heard of that as well. Please email us directly to resolve this as the board wont work properly if either erase or reset are stuck in. You sell boards with molex connectors now, right? Is this 2.54mm molex? Does this fit to Duet? These molex boards also being sold by US distributor now? Yes that is correct 2.54mm Molex compatible as you have linked, some of the headers are 3 way or 2 way as shown in the updated picture at the top of this blog post. If you email us before purchasing we can add the connectors and crimps for the wires onto the order for a nominal sum. Demand has been so high that we are out of stock for a couple of weeks in both locations. A friend is going to purchase in the US from filastruder, is it possible they add a few connectors too? I am not sure if they stock them, best to contact them directly. I am interested in creating a min & max homing macro for the syringe on a paste extruder. Since there is only one endstop per axis, I could only set the min or max for syringe position. Could I use the E0_STOP and E1_STOP (from the expansion header) and initialize them as min & max endstops using M574? the M574 gcode in RepRapFirmware does not current support reconfiguring the endstops in the manner you describe however there is no hardware reason why this would not work. The functionality needs to be added to the firmware though. I'm using dual Y on my cartesian printer wired in parallel at the moment, but as I want to enlarge the printer, I'm looking at using the spare E1 driver for the second Y motor. Is this possible, and how would I go about doing it? 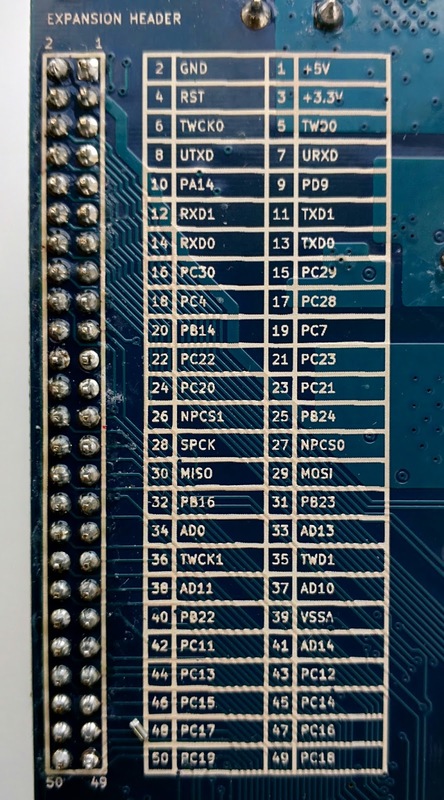 Excellent board you have by the way :) Big step up in all aspects, ease of use, build quality, print quality etc., compared to my previous mega/ramps. but only 1 drive per axis. Which may have been implemented by another developer. I did see now that you made a request regarding information from the last user post at Github. I use a customized Shapeoko2, with a gantry that is quite beefy and heavy, so being able to use two drivers would give me some more peace of mind. That being said it's currently running 180mm/s travel without missing steps, so capable it for sure is. I have an issue with an extrernal stepper driver and the duet board. If you or someone else has any idea how to solve it please share it with me. When 23HS22-2804S, a nema 23 stepper motor, is connected to the duet board expansion pins with an external driver (M542T) is looses steps and doesn't work smoothly. Using an arduino MEGA to test the driver and the motor, the motor is working normally without loosing steps. I cannot set the driver at 200steps/rev because there is no configuration for this value. The default is 400 steps/rev. Do I have to change something on the firmware? Do I have to configure the firmware to reflect that? Thank you! Firstly the M542T (from the data sheet) looks like it is a 5V device, while the Duet is 3.3V so for reliable operation you probably need to step up the Step, Dir and Enable signals from 3.3V to 5V. The Arduino MEGA operates at 5V so that may explain why it works well with that. I would get it working in 1 direction first then diagnose the direction timing.